An informative and personal account of the early days of nuclear submarine operations that were so vital to winning the Cold War. 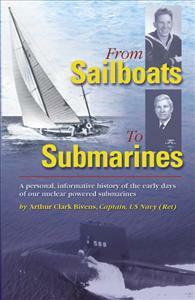 From Sailboats to Submarines is a personal account of the U.S. Navy submarine fleet during the 1950s and 60s, which was the height of the Cold War with the Soviet Union. It was a time when our submarine force was changing from diesel to nuclear powered submarines, when voyages were limited only by the endurance of the crew. It is an informative and personal account of those magnificent naval achievements that were so vital to winning the Cold War—An absorbing adventure story, with humorous anecdotes and disastrous events, spiced with romance and the experiences of a Navy family. A great book written by a great man and grandfather.